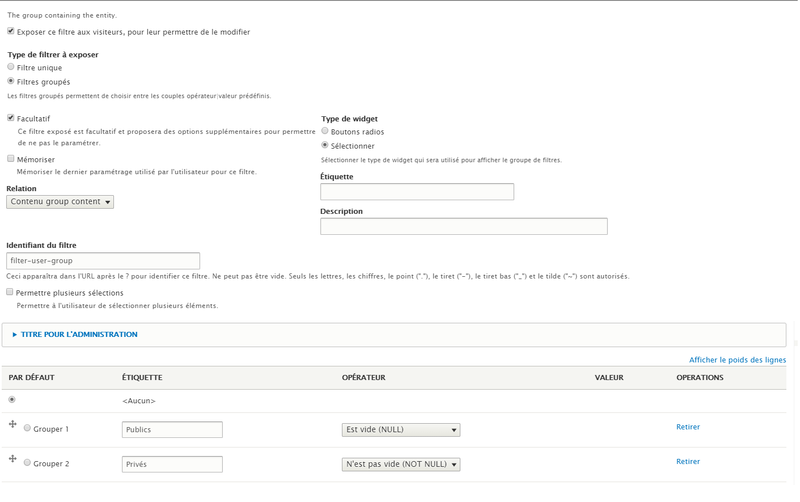 I am working with drupal 8.6.10. I am using group module. I have a view that shows Public's Content, and Group's Content for users with group. So my filter is based on group id. I tried to combine the view settings that able to select Null and Not Null Value. But when I select other filter value (a group name) it doesn't work : when I select a group in the filter it s like I select 'All'. //Get the computed user group(s). How to customize exposed filter for date field? How do I filter a view with a field on a group the current user is in?